And thank goodness it did, because I just spent all my money from my last pay... oops? I guess my uni fund is going to be a little bit smaller than I thought it would be, haha. Now I have much more money to spend on new clothes, stationary, and food of course. Did I mention I graduated? Well I did, lol. I'm never ever going to have to go back to school again after my final exam on the 1st of June. Woah. Anyways, I absolutely adore this beautiful little bracelet, and am so grateful to my parents not only for this gift, but also for putting up with me and my meltdowns all through my school life! For those of you who don't know, leavers diner is kind of like the British alternative for prom. My year is going to have our leavers diner at the Hilton Hotel in Glasgow, so I'm really excited for it! It's been a lot to organise, but I've finally sorted out my dress, shoes, bag, as well as booking my hair and makeup appointments! 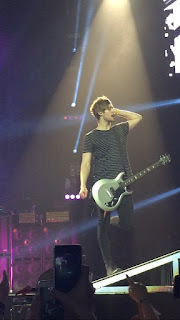 As some of you might know, back in March I went to see 5sos twice. One of their support acts, Don Broco, really surprised me, and I've fallen deeply in love with their music. In fact, I'm listening to their song 'Nerve' as I write this post right now.